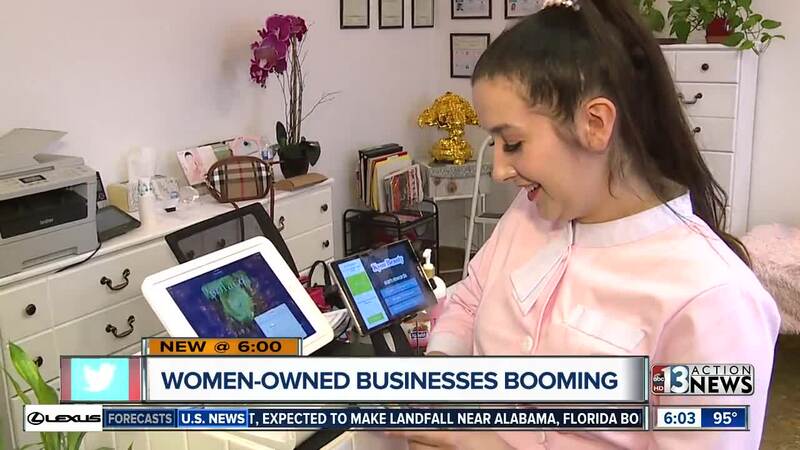 More and more women owned businesses are opening up in Nevada -- particularly in Las Vegas. A new report shows Nevada is the No. 1 state where women-owned businesses have grown most in the last decade. More and more women owned businesses are opening up in Nevada -- particularly in Las Vegas. A new report shows Nevada is the No. 1 state where women-owned businesses have grown most in the last decade. Las Vegas ranks 8th in cities that experienced this trend. Experts say we have also have a diverse community that means different markets to cater to. Part of the reason why we have a lot of women entrepreneurs here is because they see a blend of necessity and opportunity. Kyou Beauty Salon and Spa along Spring Mountain Road opened just over a year ago. The salon provides Japanese skin care and treatments. Its co-owner, Rachel Rigall, says, "We realized there was really a need for it in Las Vegas. There's a lot of dry skin." Rigall is one of the growing number of women entrepreneurs in Las Vegas. What makes Las Vegas so ideal for business? "I'm from Texas because they have tax breaks that are very similar. The price of property is much higher so over here it's much more affordable to get a business started which is wonderful," says Rigall. Kathleen Taylor of Nevada Women's Business Center says Nevada's tax incentives are one thing. Some women become entrepreneurs after experiencing a setback in employment while some are more willing to step out of their comfort zone. "I am tired of making money for other people. I have the skill set to do this myself. I'm going to try this out on my own," says Taylor. Plus, there are many resources available for new business owners. The Nevada Women's Business center together with the Small Business Administration offers help to starting and already established businesses through counseling or exploring funding options. "We also have SCORE which is a volunteer based mentorship program for entrepreneurs. We also have the small business development centers as well," says Taylor. If you're thinking about becoming your own boss, Rigall says, "You can't be afraid to fail. If you're afraid to fail you will never be successful."